In an unidentified major European logistics enterprise where robots had been introduced with great effect to transport goods around the warehouse floor, the human workers, anxious they would lose their jobs, reportedly began kicking the robots over and then complained that they broke frequently and could not work as well as humans. Such neo-Luddism exists not only at the level of rank-and-file workers, but also at a management level, said Nikolai Legkodimov, a partner and head of emerging technologies in risk consulting at KPMG in Russia and the CIS, who told this anecdote at the Effective Manufacturing 4.0 conference held at the Skolkovo Technopark on Wednesday. Managers at enterprises where staff have been laid off due to automation of processes often say that they have “failed to preserve the team,” he said. The Effective Manufacturing 4.0 conference also included an exhibition of startups offering solutions for industry. Photo: Sk.ru. Yet artificial intelligence – the main focus of the plenary session of the Effective Manufacturing 4.0 conference – should be used to improve the efficiency of manufacturing processes, not replace people altogether, said Igor Bogachev, CEO of Zyfra, an industrial digitalization technology developer that organised the two-day conference together with the Skolkovo Foundation. “Artificial intelligence is something that should help people to do their work better; it’s not a replacement for people,” he told the conference. Another obstacle encountered when introducing artificial intelligence is that companies fail to see an economic impact. This is because projects should be introduced on a small scale into specific business processes that offer an economic advantage straight away, said Bogachev. Automating processes should be done not for the sake of automation, but with a practical goal in mind, agreed Yevgeny Borisov, development director of the Internet Initiatives Development Fund (FRII). He cited the example of a large U.S. producer that had recently complained to him that they had become disillusioned with the Internet of Things (IoT). “We put up sensors everywhere, collected data, and then wondered ‘where’s the money?’” Borisov cited a representative of the company as complaining. “Startups need to make not just technology, but a business model that uses that technology,” he concluded. 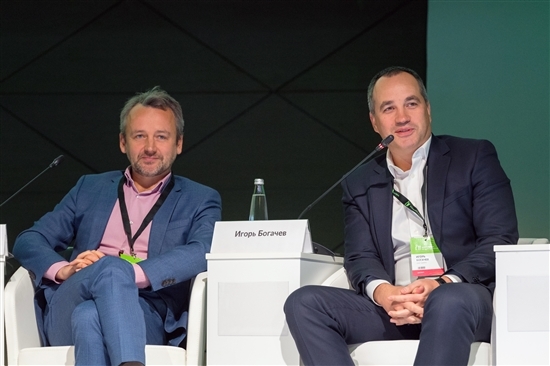 Skolkovo's Alexei Belyakov (left) and Zyfra CEO Igor Bogachev at the conference. Photo: Sk.ru. 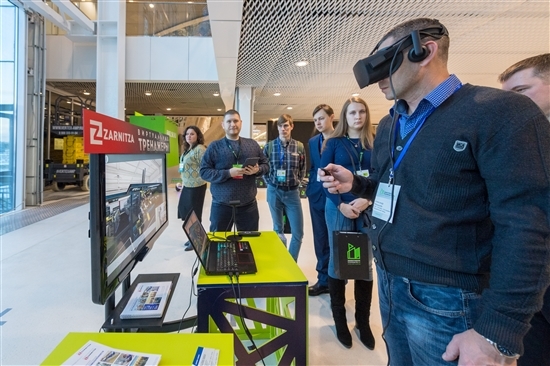 The Skolkovo Foundation counts more than 100 companies working on digital technologies for effective manufacturing, or industry 4.0, among its resident startups, said Alexei Belyakov, head of Skolkovo’s advanced industrial, nuclear and space technologies cluster. Current trends in this field include demand for technology that monitors employees' productivity, IoT platforms, and predictive analytics for use in industries including oil extraction and machine building, Belyakov told the conference. Companies want to see concrete solutions that will optimize or accelerate business processes, offering clear monetization, he said. 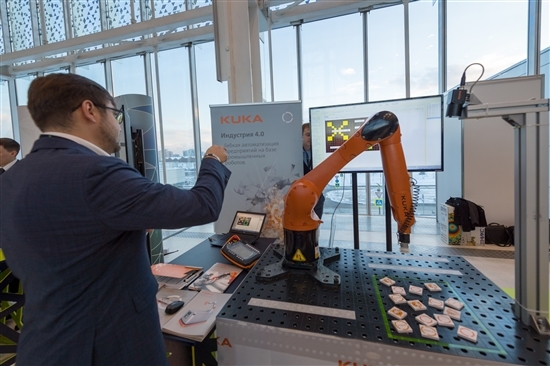 “This year, Skolkovo Ventures launched a fund devoted to industry 4.0 with corporate partners including Russian Railways and Russian Helicopters,” said Belyakov. The IoT market in Russia is expected to reach value of 400 billion rubles ($6 billion) by 2020, of which more than 50 percent comes from the industrial sector, said Belyakov. That’s more than double what it was worth in 2017, he said. Virtual, augmented and mixed reality are all used in industry to make processes more efficient. Photo: Sk.ru. There is no doubt that technology can make industrial processes incomparably more effective. Borisov cited the example of an enterprise in Russia’s Urals region where digital twin technology was used to work out how to improve efficiency at the plant. The solution found using the digital twin resulted in productivity tripling, he said. However, before any industrial processes are automated or digitalized, they should always be running in an orderly manner, cautioned the experts. “If you automate chaos, you’ll only get more chaos,” said Valery Teplov, manufacturing director at Russia’s United Engine Corporation (ODK). Roland Bent, technical development president at Germany’s Phoenix Contact, which produces industrial automation solutions, agreed.